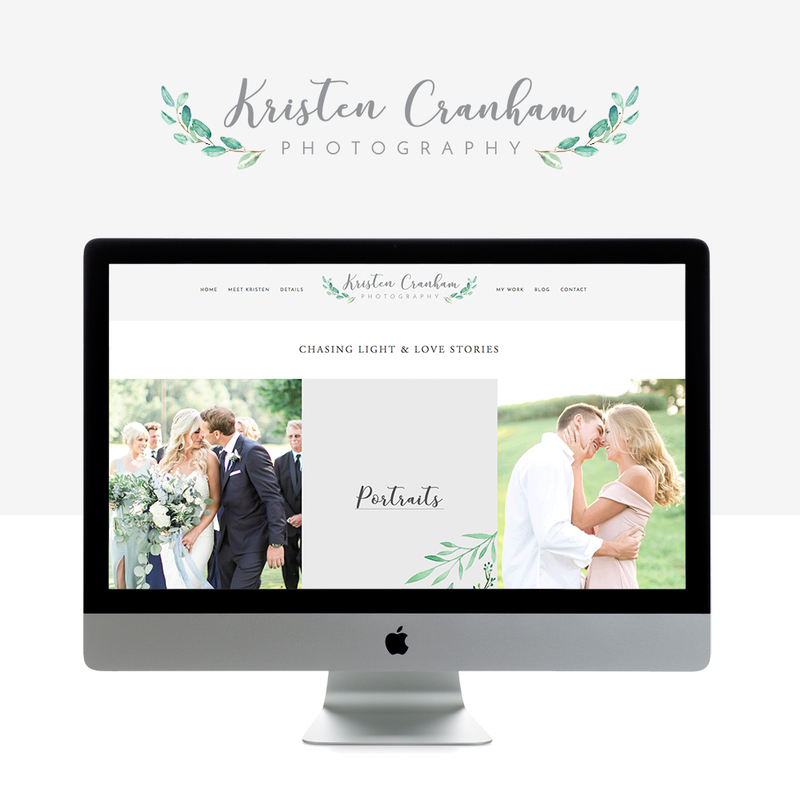 Kristen Cranham is a young wedding photographer located in Virginia who runs her photography business while also going to Virginia Tech full-time. Can you say #girlboss? Kristen wanted a Restyle to showcase her neutral and elegant photography style, but also to make sure she had a touch of playfulness throughout her brand! We love all the greenery illustrations we got to use for her site to give it a little extra touch of femininity. Kristen chose Dusty Rose for her Website Template, and it ended up working perfectly for her brand because the design and layout is kind of loud and playful, but by using soft colors and elegant fonts, we were able to tone it down a bit and get the perfect balance we were looking for. Kristen shared how she got started in photography, how she finds the time juggling being a full-time student and a full-time girlboss, and how she gives herself grace in her business. KRISTEN: In high school, my family did interim foster care for newborn babies. My mom always wanted to get pictures of them because the adoptive parents felt they had missed a lot of their lives already. I wanted to give parents images of the babies once they were adopted just of the time that they spent with our family. I learned quickly that I wasn’t cut out for newborn photography, but I fell in love with the reactions of the parents and how much joy it brought them. That’s kind of where it all began, and from there I just started dabbling with portraits, and then got into weddings. GO LIVE: DID YOU TEACH YOURSELF PHOTOGRAPHY OR DID YOU HAVE HELP ALONG THE WAY? KRISTEN: When I was 15, I started emailing all of these photographers in my area saying. I just offered to see if anyone would be interested in hiring an intern. I did not hear back from most of them, but I did hear back from one. She taught me all of the basics, and then after that, I was self-taught. I would watch YouTube videos, or I would just go outside and photography a bush just to understand about exposure. GO LIVE: WHAT'S THE HARDES LESSON YOU'VE LEARNED IN YOUR BUSINESS? KRISTEN: Giving yourself grace and understanding that you’re human too. I think I struggle the most with feeling like I was failing just because my turnaround time isn’t as fast as some others just because I am in school full time. But, I have learned that when your brides book you, they know that you have all of this other stuff going on, and I’ve had brides that book me just because I go to Virginia Tech, or they were in the sorority that I am in in. Ultimately, your clients will book you because they like what you’re doing. They know that you are busy, and I think that was the biggest learning experience for me to understand that they knew what was going on in my life and that they would be patient. KRISTEN: Never underestimate how far you can come with your time. A lot of people don’t think you can do it when you have other things going on in your life. I think this speaks not only to people that are trying to do it in college, but also people who have children, and who are working a full-time job on top of building a business. Never allow yourself to accept that you are too busy to follow your dream because there’s always time and you just have to make it. GO LIVE: WHAT DOES IT MEAN TO YOU TO GET A RESTYLE WITH GO LIVE HQ? KRISTEN: Getting a Restyle means more to me than I can say. Being a full-time college student and growing my business in high school and college has been tough to say the least. In my opinion, I didn't really even know who I was when I started this business, so it really has grown with me and is one of the most important aspects of my life. My goal is for my brides and clients to fall in love with a site that is nothing but me. I want them to not only choose me for my pictures, but choose me because they think I will be the best fit for them. My hope is that through this new site, my business will grow exponentially and my online presence will be better all around. Congrats to Kristen on her GORGEOUS Restyle! Make sure to give her a follow as she goes live and lives her dream! To see what she's up to, follow Kristen on Instagram and Facebook. Want this look? Get the Dusty Rose Template!